Looking for a great FREE family camp this summer? I have heard wonderful things about this camp - but spaces fill up quickly (limit 30 participants). So if you are interested, check it out and sign up as soon as possible! Age for participants is between 9 and 14 years old and children must be accompanied by a parent or guardian. 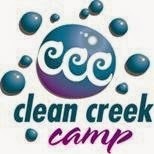 FREE Family Clean Creek Camp Join your kids outdoors this summer for 3-4 days of outdoor adventure at Clean Creek Camp. We'll explore in and around Austin's creeks and aquifer. Groups with adult leaders are welcome!